Book #1 of The Genesis Trilogy. This special reissue of a classic work of spirituality from the author of A Wrinkle in Time offers life-transforming insights on the rich heritage of the Bible and shows how the characters of this ancient text are relevant for living the good life now. Includes a new reader's guide. In the first book of her Genesis Trilogy, beloved author Madeleine L'Engle casts long, loving, and perceptive glances not only at the created universe but also at its Creator. L'Engle often crafted stories that dealt with the complexities of the universe, navigating time and space, religion and science, with uncanny ease and insight. This skill--most famously demonstrated in A Wrinkle in Time--is showcased in this nonfiction work, And It Was Good, through her ability to see the connection between Made and Maker at every level. She examines the vast beauty, order, and complexity of our world with enthusiasm and reverence, illuminating the characteristics of God, the first poet. Madeleine L'Engle possesses the same ambidextrous skill of storytelling as other literary giants, including C.S. Lewis and George MacDonald. Her fictional stories appeal to generations of readers, and are equally embraced in both the secular and religious markets. But it is her ability in her nonfiction to engage with the historical text of the Bible through a dynamic unpacking of protagonists, antagonists, and matters of faith that establishes The Genesis Trilogy as a highly treasured collection of spiritual writings. And It Was Good beautifully approaches both the biblical text and creation itself with an intelligence and sensitivity that appeals to all seekers looking for a fresh communion with God in the natural world. 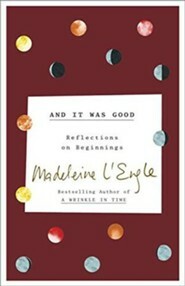 Madeleine L'Engle was the author of more than forty-five books for all ages, among them the beloved A Wrinkle in Time, awarded the Newbery Medal; A Ring of Endless Light, a Newbery Honor Book; A Swiftly Tilting Planet, winner of the American Book Award; and the Austin family series of which Troubling a Star is the fifth book. L'Engle was named the 1998 recipient of the Margaret A. Edwards award, honoring her lifetime contribution in writing for teens. Ms. L'Engle was born in 1918 in New York City. She wrote her first book, The Small Rain, while touring with Eva Le Gallienne in Uncle Harry. She met Hugh Franklin, to whom she was married until his death in 1986, while they were rehearsing The Cherry Orchard, and they were married on tour during a run of The Joyous Season, starring Ethel Barrymore. Ms. L'Engle retired from the stage after her marriage, and the Franklins moved to northwest Connecticut and opened a general store. After a decade in Connecticut, the family returned to New York. After splitting her time between New York City and Connecticut and acting as the librarian and writer-in-residence at the Cathedral of St. John the Divine, Madeleine LEngle died on September 7, 2007 at the age of 88. I'm the author/artist and I want to review And It Was Good: Reflections on Beginnings - eBook.